New mining practices are underway at an underground coal operation in Mexico after changes in geological conditions led to increased coal seam outbursts, putting miner’s lives in danger. To keep operators away from the risk of outbursts the site now operates using a tele-remote system. The site anticipated decreased production levels with the new system but has worked with operator training company, Immersive Technologies, to develop simulation based training so miners can operate the equipment safely without production losses. The road header is fitted with a tele-remote control keeping all miners away from the cutting face. Additionally shuttle car operators are required to exit shuttle cars 80 meters away from the face and operate remotely. “Safety is our highest priority so going to a remote system was essential to protect our personnel. As part of this integration we wanted operators to be skilled and keep damage to the machines at a minimum. We partnered with Immersive Technologies to deliver the safest and most productive solution,” says Armando Diaz Cardenas, General Mine Manger – Mine VII, Mimosa. Training will be delivered using a simulator specifically designed for underground operations. 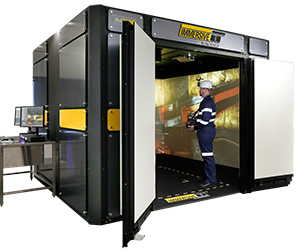 With its 360 degree high definition screen and RealMove™ technology, operators can freely walk around the mine and equipment, allowing for realistic training for Red Zone avoidance, proximity sensor training, prestart and walk around. “The requirements for operator training in an underground environment pushed us to rethink our approach to operator training; the operators are no longer sitting in a cab surrounded by controls, they have to have the freedom to move around their environment and operate from multiple positions. For Mimosa we had to take it one step further and provide a simulated tele remote station to effectively train operators before the new system went into operation,” said Richard Beesley, Underground Coal Business Unit Manager from Immersive Technologies. Mimosa is located in Coahuila, Mexico and extracts about 4 million metric tons of coal annually. Changes in geological conditions causing increased facial outbursts led the Mimosa mine site to use a tele-remote operated system. The site anticipated decreased production levels with the new system but has worked with operator training company, Immersive Technologies, to develop simulation based training so miners can operate the equipment safely without production losses.